APPLICATION: Hanging string lights, globe lights and lanterns at night. Hanging photos. Dry clothes and sunbathe at day. Keep safety of hanging lights in the air. According to your yard, different lighting suspensions can be designed to enhance the visual effect. TIPS: It can not be used to hang overweight outdoor items, and you need to tighten the screws when you install. If you have any questions about this product by Factre, contact us by completing and submitting the form below. If you are looking for a specif part number, please include it with your message. 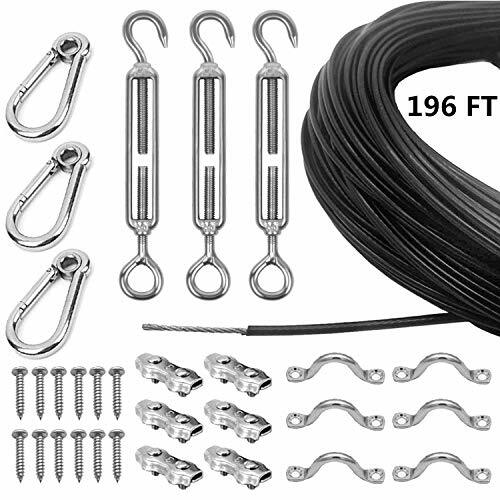 Preynos Globe String Light Suspension Kit, Galvanized Steel Cable, 110 ft, With Screw eyes, Turnbuckle, and Hook, More attachments included!